Vox reports on Rep. Ilhan Omar, who, in a historic first, became one of two Muslim women seated in the US House of Representatives this year. Omar’s opinions have not always been welcomed by the GOP—or by some Democrats, for that matter. In February, her criticism of the pro-Israel lobby in the United States was badly misinterpreted as anti-Semitism. 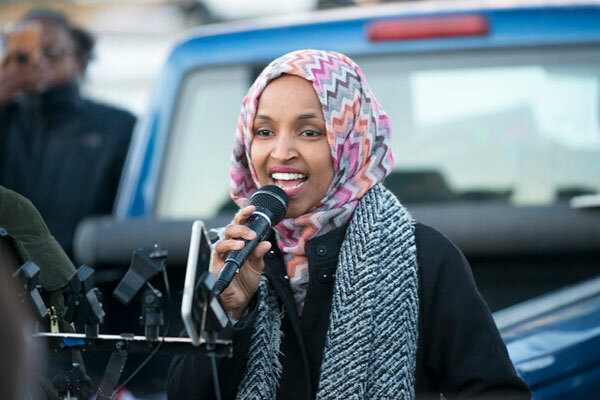 That controversy ended with a strange condemnation of both anti-Semitic and anti-Muslim discrimination that barely sidestepped a sanction of the Minnesota Democrat herself. Often, the attacks against Omar have seemed to be much more about who she is than what she says. This week, she found herself under attack by President Trump for saying that not all Muslims should be held responsible for the 9/11 attacks. It might be worth remembering here that a total of 19 people carried out the 9/11 attacks. Pew has estimated that the Muslim population in the US is 3.45 million. It doesn’t matter how good you are. If you one day find yourself in a school where other religions are talked about, but when Islam is mentioned, we are only talking about terrorists. And if you say something, you are sent to the principal’s office. So to me, I say, raise hell. Make people uncomfortable. Because here’s the truth, here’s the truth, far too long we have lived with the discomfort of being a second-class citizen. And frankly, I’m tired of it. And every single Muslim in this country should be tired of it. Meanwhile, Trump predictably responded with a tweeted video that interspersed footage of Omar with the Twin Towers collapse. He has refused to take it down. The representative says death threats and anti-Muslim insults against her are spiking as a result. Other Democrats have stood up for her at this time, accusing Trump of inciting violence against another elected official. And Omar is by no means standing alone. According to the Federal Election Commission, Omar has raised $830,000 over this last quarter, most of it in donations of less than $200 and less than $10,000 from PACs. This outpouring places her among the top-earning Democrats over the last quarter. Rep. Alexandria Ocasio-Cortez (D-NY), who has also been under attack, raised about $720,000, while House Speaker Nancy Pelosi and Majority Leader Steny Hoyer raised about $650,000 and $600,000, respectively. Democratic colleagues are among those donating; House Majority Whip Jim Clyburn and Ocasio-Cortez contributed $1,000 and $2,000 respectively. The first Omar controversy, in February, did not, contrary to popular perception, begin with an Omar tweet. (A piece by Matthew Yglesias, on Vox, did a handy job of untangling the whole story.) In the beginning was the House Republican leader, Kevin McCarthy, who, as the Jewish Telegraphic Agency (JTA) news service reported, planned to take action against the freshman representatives Omar and Rashida Tlaib, the first two Muslim women in Congress. It wasn’t immediately clear what he wanted them reprimanded for, but it seemed that the cause was the two representatives’ support for the Boycott, Divestment, Sanctions movement, known as BDS. In the discussion that stemmed from the JTA report, Omar issued her infamous tweet, which she has since deleted: “It’s all about the Benjamins baby.” She followed up to clarify that the tweet referred to political donations from the American Israel Public Affairs Committee, or AIPAC, a body that exerts powerful—and well-financed—pressure on elected officials. Gessen writes that the whole picture smacks of classic bullying techniques. Political violence can work the same way. In modern states ruled by autocrats, or aspiring autocrats, political violence is dispersed and delegated. Its first weapons are ridicule and ostracism. Once a person has been marginalized and discredited among allies, physical violence becomes a likely option.